Bishop Alan’s Blog: Wendig! Schnell! 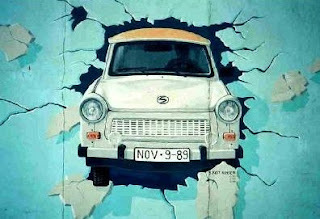 Not really a Motorhead, but on this day of German Elections, I was still bemused to learn (h/t Jane Stranz) that the fashion for Ossi-Chic retro now includes a jazzed-up Eco-Trabant, much loved 60’s/70’s symbol of East German Industrial Might and Dynamism. The Trabi, you will remember, wasn’t too bad for mileage, but spewed out such filth that roadside greenery almost visibly wilted as it went by. Among other unusual features, to refuel it you lifted the hood, poured 6·5l of petrol past the hot engine, then mixed in the two stroke oil by hand. Wendig! Schnell! 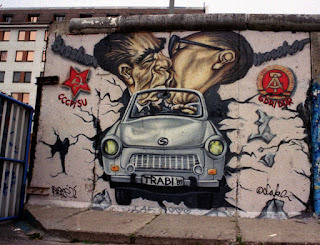 Trabant! The Car for modern man! Star of the Crap Division of the 1968 motor show, and big enough for four adults wearing (compulsory) Safety Hard Hats and fireproof overalls. 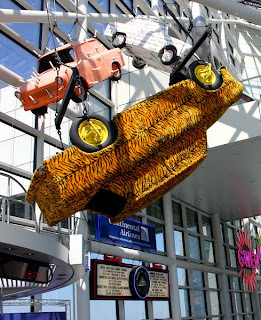 Dear old jokes celebrate the Trabant’s lightweight construction, contrary to legend actually recycled cotton-based industrial waste (“Duroplast”) rather than cardboard. It was certainly a deathtrap in crash tests. In the DDR glory days it took 15 years to supply one from Zwickau, giving rise to a strange bit of reverse-engineered Capitalism — Second hand Trabis could be considerably pricier than new on the “bird-in-the-hand” principle. Average life-span was 28 years. So from order to obsolescence was actually 43 years, almost as long as the existence of the DDR! 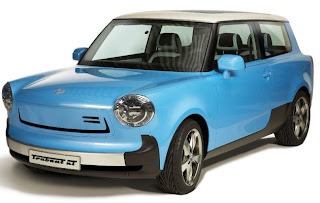 So if you can’t afford a new BMW mini, in a couple of years’ time you might care to try a new Electric Trabant, with a solar cell roof and 100 mile plug-in range, if anyone can be found to underwrite its production costs. Proof that what goes around comes around... but you’ll need to be, er, wendig & schnell. I was living in Berlin, Haupstadt der DDR back in the late 1980s. One unfortunate friend finally got his Trabi in late summer/early autumn 1989. He was not well pleased at the suden change in the car market a month or so later. Aargh! you wait 15 years for one, then 3,000,000 come along! Worse than London buses.